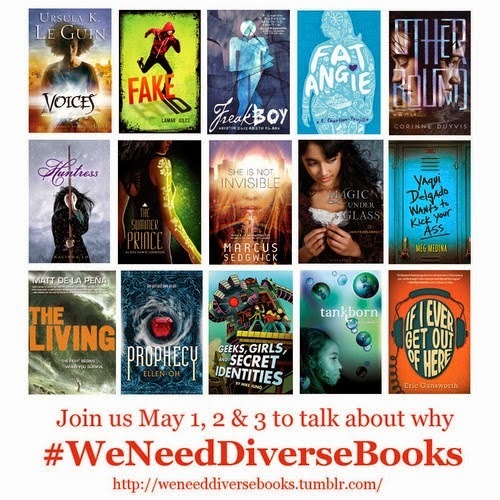 First off, thanks to Sarah at YA Librarian Tales for pointing me to the We Need Diverse Books Tumblr. The timing of this couldn't have come at a better time as this is a topic I've been thinking about a lot. For the past several years, I've presented on YA Lit at our state library conference and I will be doing so again this year. I start preparing for this presentation early on in the year, as it requires a lot of reading and keeping up with YA so I can book talk the titles I want to share. A few weeks ago, my friend Angie at Fat Girl Reading was talking about a presentation she was giving and how she tried hard to include diverse titles in her presentations. It got my thinking about how I really wanted to make sure I included diverse books in my YA presentation too and I wanted to get a head start in reading them. But when I started searching for them, diverse releases in YA for 2014 turned out to be few and far between. There are some being published, but it can be hard to find them among the many copy cat YA titles that keep appearing. And where's the diversity in genre fiction like fantasy, science fiction, romance and humor? Diversity includes so much. It includes race, sexuality, disability. And these books are so very needed. They need a spot in my library and there are readers for them. Books are a way to explore and learn. When we include more diversity in our library collections, we tell our readers they matter. We tell them that we want to feature books that include characters just like them. And we also tell them that we want them to explore those around them. We want them to learn about other races, sexual orientations, disabilities and that it's a great thing to read outside their own culture box and maybe even their comfort zone. Diversity in YA is something I've been thinking about a lot and I'm making it a goal to really try and enhance my own reading and include more diversity in what I choose to read. I hope you'll join with me and read widely and make sure to include diversity in your library. If we support diversity in YA, we can show writers, readers and publishers that diversity matters and it's needed-and we want more of it!